The Scottish Football Association's "preferred option" is for the national team to continue to play at Hampden when the lease expires, but the final decision will be based largely on cost. SFA chief executive Stewart Regan has revealed that the organisation's board is "considering the options" on where Scotland should play from 2020. "There are financial implications should we choose to stay," he said. "There may be commercial implications of taking our games elsewhere." In March, Scotland played Canada in a friendly at Hibernian's Easter Road, but a crowd of a little more than 9,000 attended the match in the capital. 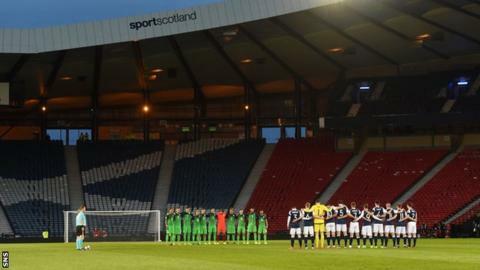 For Scotland's most recent match at Hampden, a World Cup qualifier against Slovenia in Glasgow's south side, the crowd numbered more than 20,000. Saturday's qualifier against England is expected to be sold out. "Any board faced with a lease expiry in three years' time would have a very long, hard look at the implications of renewing that lease," said Regan. "The board will be reviewing the financial assessment, the lifecycle costings to stay here and we will make a decision hopefully in the next 12-18 months. "We should be proud to have a national stadium. Other countries are building national stadia in order to bid for major events. "Having a national stadium is not the issue; it's the cost of having a national stadium and that's what we need to get under the skin of. "If it's workable, of course it would be our preferred option." Scotland play England on Saturday in a match they can scarcely afford to lose if they are to keep alive their slim hopes of reaching the 2018 World Cup via the play-offs for teams in second place. But Regan is upbeat about the team's chances, especially after the morale-boosting 1-0 win over Slovenia in March. "It has given everybody hope that, if we can beat Slovenia, who played incredibly well against England and managed to get a draw, there's no reason why we can't get a result," said Regan, who added that he thought it "inappropriate" to discuss head coach Gordon Strachan's future should Scotland lose. "It could get us right back into the reckoning for a play-off place if we were to win. "We've got matches against Malta and Lithuania after that, which we think are more than winnable, and our two biggest rivals we've got in the final matches of the campaign. "We believe we've still got a chance of a play-off spot. "Gordon was in the last team to beat England. We want him to be the last manager to beat England in a qualifier. "It's a must-not-lose match, it's fair to say. We're not going to say it has to be three points, but that is what everyone would like to see." Meanwhile, Regan stated that 19 clubs in Scotland had expressed an interest in becoming an elite academy as part of Project Brave, the blueprint to improve the national game led by the SFA's performance director Malky Mackay. "We are in the detailed planning phase between now and the summer of 2018," said the chief executive. "We have asked clubs who are interested to put forward bids to be considered to be one of Scotland's elite academies. "There's still a lot of work to do on Project Brave, but the key focus areas, which are investing in the best, focusing on the very best players within fewer academies, trying to get more game time for players, focusing on coach development rather than just coach education and better use of the loan system. "There's nobody out there who would argue against the principles."